I was scrolling through Facebook as usual when a headline caught my eye, 'One ‘last dance’ for this Wisconsin teen who has scheduled her own death' with the caption, 'Months after turning 14, Jerika Bolen, who is terminally ill, decided it was time to remove the ventilator, time to die.' [link] Along with it there was a photo of a smiling young girl. So I clicked and I was met with an article about a fourteen year old living with Type 2 Spinal Muscular Atrophy who had decided, with the support of those closest to her, to end her life after her prom. The article talks about Jerika, her disease and why she has chosen to end her life. All of which I'm not going into but you may read the article linked above. The reason I'm not going into any of that is because I'm not living Jerika's reality. Who knows? Maybe if I was in her position and that was choice available to me, perhaps I would choose the same. My opinion would be coming from a place of privilege, someone whose health has been relatively great despite my disability. I've had far less operations, chest infections and pain than others with my disability, never mind other disabilities. I know I'm lucky. As such I wouldn't feel right commenting on her decision. What's more I feel it's irrelevant to the reason I'm writing this post. 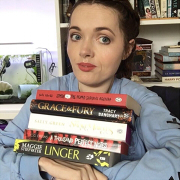 The truth is I'm on the fence when it comes to the right to die movement and when I wrote about Me Before You I wrote about it with that in mind. I'm on the fence because I can't physically put myself in someone's shoes and truly know their pain. I'm on the fence because I can't imagine not having the choice because I lack the physical ability. I'm on the fence because I don't trust the government or whoever to be able to implement and regulate assisted suicide on a wide scale without it being abused. I'm on the fence because we already see the difference between the narrative surrounding a parent that murders an abled child and a parent who murders a disabled child. I'm on the fence because the idea that it could become any more socially acceptable for me or my friends to want to die terrifies me but at the same time I live my life as someone who respects choice. And that's what led me to write this post. The story may have drew my attention but it was the comments on the article that really hit me. They reminded me why I was so fervidly against Me Before You and led me to challenge some of the things I was seeing said. Many of the comments I saw on the article were of the opinion that in this instance death wasn't a choice but a given. That we should think of it as a choice to end suffering rather than to die, I guess in a bid to make it more palatable? That the disability made the decision. Many hailed it as an active of bravery and some went as far as to say because medical intervention such as ventilation was involved that choosing to remove it wasn't suicide, it was 'letting nature take it's course'. All of which is incredibly offensive and troubling to me. And by not challenging these ideas and letting them be perpetuated I fear for the disabled community and my friends. We need to be able to have an open and civil dialogue about disability and suicide - assisted or other - without the narrative I've frequently heard surrounding it. We need to be able to talk about disabled people choosing death without it being seen as an act of bravery. It has to be possible to discuss it while at the same time teaching society it isn't an inevitable or the only logical decision. We have to talk about it without perpetuating the idea that a disabled person's death is any different than the death of an abled person. If we are going to continue the discussion about having the right to die we need to change the narrative because it's a slippery slope from 'it's not really suicide' to 'it's not really murder' and that frightens me as part of the disabled community. We need to be able to argue for someone's right to die without undermining the lives of those in similar positions. It must be person based language rather than disability based so that society does not associate choosing death with that particular disability. Most of all we need disability awareness and representation. 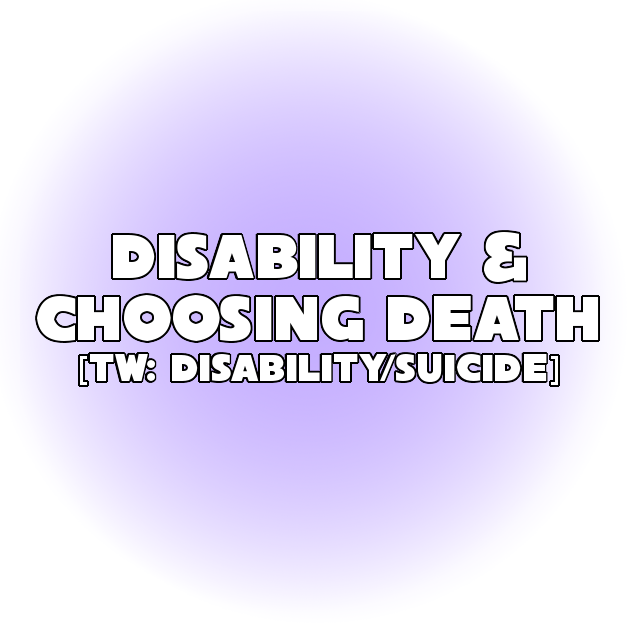 It's important that the only time we see these disabilities mentioned in the media isn't when someone chooses death or relating to death in general. It's important we also hear of the many people living with similar disabilities every day, who don't wish to end their lives. 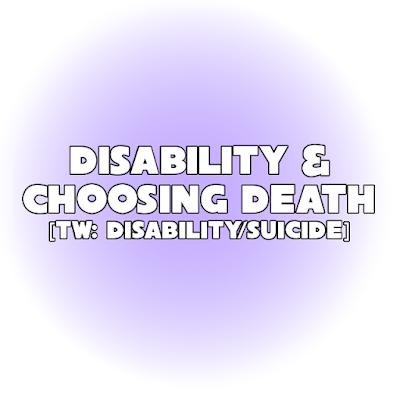 So when the discussion of disability and suicide comes up there isn't this constant narrative of acceptance, justification and normalcy from many that we don't see when abled people choose death. Disclaimer: I would like to reiterate the fact I do not want to discuss the details or put forth a stance on the particular case linked above despite it being the inspiration for this post. Really insightful stuff, this. Though my first comment would be a semi-negative one to the article you posted ("She has a girlfriend too; she's gay." - I'm not sure why telling us she is gay was really relevant. Just saying, she has a girlfriend, is more positive. :P), this was something I'm glad I saw, as it's something I usually wouldn't decide to read about. I'm with you, very much on the fence. If somebody is in so much pain and their quality of life is terrible, then, yes, I understand their decision. A friend of mine lost his battle with cancer this year, and in the months leading up to his death, myself & my best friend (his ex) were prepared for 'the worst', and happy for him when he finally passed on. It was what he wanted, and he was happy to have lived a good, happy life until that point. I think this subject is one that needs to be discussed more, in a neutral light, instead of a negative one. Thanks for sharing this! Euthanasia is a heavy topic. Theres a FANTASTIC documentary called How To Die Oregon thats covers it really well although the people who are seeking to end their lives all have cancer. I know I have been in some pretty dark places with my illnesses and have considered suicide, especially after I became disabled/wheelchair dependent. I definitely agree with a lot of what you have said here, language is so huge. Thanks for writing this, its a tough subject but one that is important. A friend threw herself into a path of a train a few summers ago because her Lyme Disease became too brutal for her to deal with. It was really really sad and yet I understood why she made the choice having the same disease. Euthanasia is something that offers dignity, it offers choice, and it's also in its own odd way a "beat the bastards" thing that allows people to decide their own destiny. When it's by fully competent choice, it's a mercy that I believe everyone should have a right to when there is no other hope. But I also have that small part of me that if it were one of my loved ones that would want to keep them for as long as possible. It's something that most of us would hopefully never have to understand and come to terms with, and I really hope it's something I never have to either. Thankyou for writing this post, it's a controversial topic so I'm glad that you've shared your views on it. I have always been someone who supports the right for people to have a choice when it comes to assisted suicide/euthanasia, but I still find myself questioning my opinions on it. I agree with everything you've mentioned in your post and it's definitely something that needs to be discussed more.